Look, I know, this recipe is embarrassing. 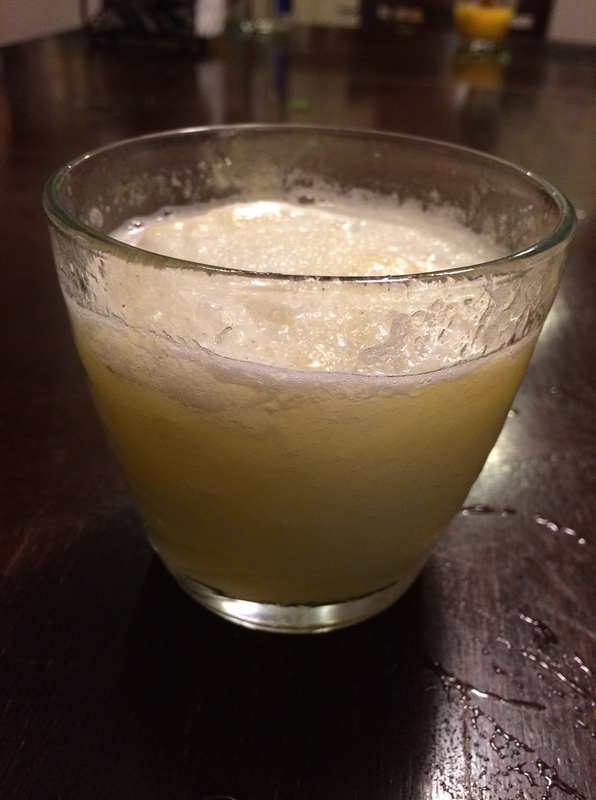 I’ve been making frozen lime and mango margaritas for years. I’d love to pretend that mine are sooo much better because I make them with fresh ingredients and love, but that’s just not true. 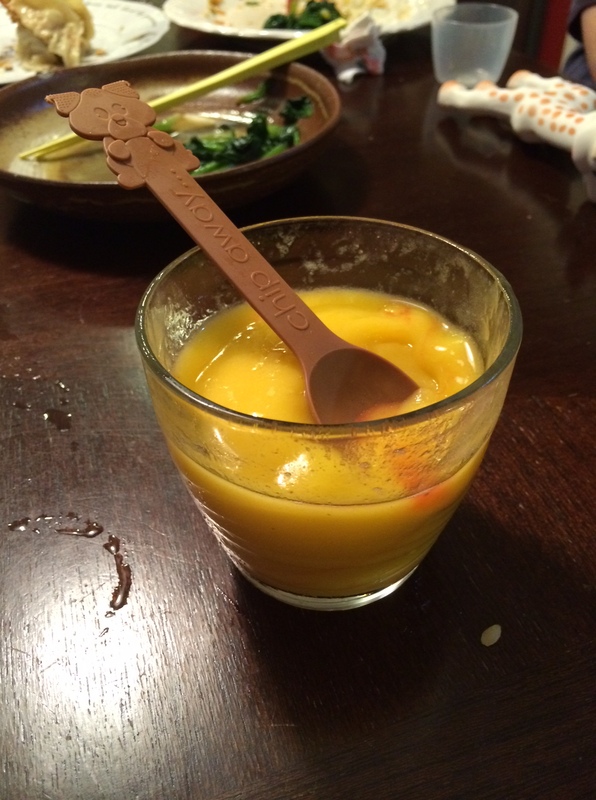 I made these because I wanted to have an easy way to have frozen drinks on minimal notice this summer. And they disappeared. I ran out of mix and had to get more. Then I made them for a friend with a Vitamix, and she didn’t believe the recipe was as simple as I confessed when asked. Then I made them again, and was told by yet a third group of people that they were the best frozen margaritas they’d ever had, and I had to scratch my head, because the recipe is as simple as this: Ice, mix, tequila. Just eyeball it. Really. I throw in the ice cubes for the quantity I want, add the tequila I want, then add mixer until almost at ice level. I keep the tequila in the freezer to reduce the amount of ice I need to use. Mix on high and enjoy. Garnish with a lime wedge and/or salted rim if you like. You can see how much effort I put into these, I threw the ingredients together and then threw it into some IKEA kids cups. It was still a huge hit. My wife and I are huge fans of high quality hawaiian shaved ice, or as they’re known in Japan, かき氷 (kakigori). Much like my blender experience in Japan, good shaved ice was the norm, and easy to find at summer festivals throughout the warm months of the year. Moving to the states, snow cones, Kona Ice and similar frozen treats weren’t quite scratching the itch, and shaved ice treats are not cheap here. This summer we found a great deal and pulled the trigger on our own shaved ice machine so we could create our own syrups/toppings and enjoy shaved ice whenever we wanted. I used a strainer after blending, but no surprise, there was nothing to be caught in the strainer. I shaved the one of the two watermelon blocks on July 4th, and I can only describe it as being like frozen cotton candy. It was incredible! It also made an incredible mess, which I cleaned up before realizing what a hit the shaved watermelon was, so I held off on making the second block until my wife’s family was visiting later that summer. Again, even after multiple weeks in the fridge, the shaved watermelon is likely the best way to enjoy watermelon I have ever found. Yes, the Vitamix cleanup is easy, but the shaved ice machine is not. Cut out the watermelon, avoiding the rind, and put it in the Vitamix. Blend on high until no pulp is left. Pour into plastic containers and freeze. Shave watermelon ice block as finely as possible. This is probably the best thing I have made with my Vitamix or shaved ice machine that I will not regularly make, just because of the concerns I have around clean up, but if you have access to a shaved ice machine and interested, I do highly recommend this, as it really is a special treat! On June 23rd my family headed to Japan for six weeks. My wife and two kids flew to Japan where my two kids were each able to enroll in at least three weeks of school, and then have a few weeks of summer vacation in Japan before they come back on August 5th. Today is the 41st day since they got on that plane, and it’s been rough. I expected it to be rough six weeks, but it got significantly more challenging than I expected after I broke my arm badly early in June. I’d say I’m normally in decent shape; I’m a healthy weight, love mountain biking, enjoy road biking as well, and my wife cooks incredibly healthy and tasty, usually Japanese, meals. My expectation, prior to breaking my arm, was that during these six weeks I would be able to ride my bike to and from work most days, go out for long rides on the weekends, and have a lot of free time to exercise to offset whatever unhealthy diet decisions I made because of eating out. Boom. Break my arm, plans change. My arm was broken badly. It was an intra-articular, displaced, open fracture of my distal radius with multiple large fragments. Multiple doctors told me to expect surgery following the break, expecting the bone fragments to shift after an initial reduction and plaster cast that set the bones well. In other words, while I’ve had a CT scan and seven sets of X-rays since the break with an eight set coming up Tuesday, I’m extremely lucky that I managed to avoid surgery. I managed to escape with just the excitement of a bi-valve, antibiotics, multiple casts and a now a split. That said, the break was bad enough that for the first several weeks I was told not to use the hand, keep it elevated and not move it any more than necessary, which I took very serious to maximize my chances of avoiding surgery. But long after the injury, I’m home alone. A long handled bath brush helped with bathing, but I still needed to take care of feeding myself, except now I had to do so with one hand while also needing to cut back on calories to account for my lack of physical activity. A good amount of leaves, small bit of each vegetable, a flavor vegetable or two, a handful of fruit and then yogurt, almonds and flax seeds along with a mix of ice and water blended to make a frozen green smoothie. That list includes all the ingredients needed for the permutations I can remember off the top of my head. A coworker I’ve been sharing my green smoothies with was most impressed with one that used shiso leaves, as that seemed to be a surprisingly good addition to what would have otherwise been an unremarkable green smoothie. Yogurt and almonds also help more than I would have expected. I’ve also occasionally enjoyed a banana milk for breakfast or lunch, which are especially enjoyable on the hotter summer days, and are hopefully giving my healing wrist that much needed calcium. I’ve managed to keep working through this injury, and I’ve managed to avoid gaining weight during this injury. If I didn’t have my Vitamix , I’m fairly certain I’d have been eating out more, gaining weight, spending more money and getting less nutrients. Staying at my current weight means one less hurdle to deal with as I go through my recovery. I won’t lie and say I’m in great shape now. I tried jogging after moving from the cast to the splint. Jogging was tougher than it used to be, and I’ll need to exercise regularly to get back in shape. But an almost daily green smoothie helped me ensure that I was constantly getting a good mix of vegetables and other healthy foods in a quick, enjoyable, low-calorie way. Even when my arm was aching and I didn’t feel good, I could whip up a green smoothie without too much trouble and ensure I was eating well. My family will be home this week, and I should be able to gradually do more and more with them as the wrist continues to heal. Hopefully my recovery will continue to make steady progress, and I’m looking forward to getting back into shape. After my last post I decided to make a soup that I’ve made a few times in the past. It’s very easy, pretty good, but not popular with my kids, which is why I can only give it three stars and why I haven’t posted about it in the past. This time around I decided to make a video showing how easy it is to make. Steam or microwave the frozen broccoli florets. While doing that, prepare the correct amounts of the other ingredients. 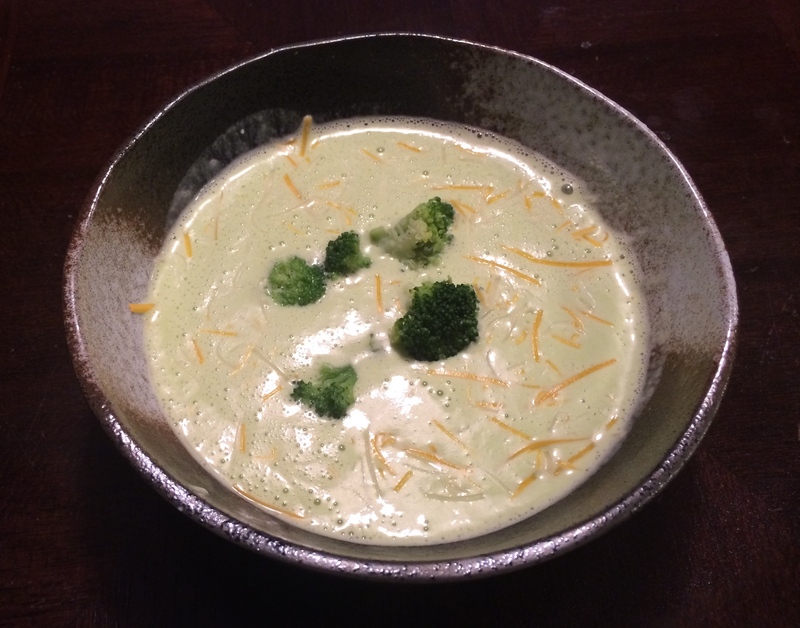 Put two-thirds of the broccoli in the blender along with all of the other ingredients. Blend on high with the tamper for about 5-6 seconds or until steam is coming out of the top of the blender. Once the soup is done blending, pour into bowls and garnish the bowls with the remaining steamed florets and shredded cheese. This recipe is twice the size of the Vitamix Whole Food Recipes recipe that I based it on, and can easily be cut in half if making it for one or two people.